Boston, Mass. - Seven Terriers found the back of the net to help the No. 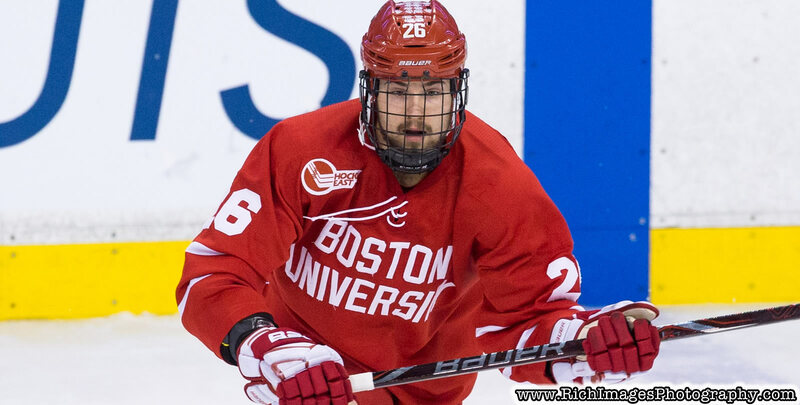 8 Boston University men's ice hockey team post a 7-1 exhibition victory over Acadia on Saturday evening at Agganis Arena. Freshmen Joel Farabee and Jake Wise each recorded a goal an assist for the Terriers, who will officially open their 2018-19 schedule on Friday (Oct. 12) at No. 10 Minnesota State. - BU scored twice in the first four minutes and never looked back, holding a 2-0 lead after the first and a 5-0 advantage through two periods. - The Terriers built a 7-0 lead just over eight minutes into the third after a highlight-reel shorthanded tally from Farabee. - Freshman Matthew Quercia opened the scoring with BU on the penalty kill as his innocent clear from the top of the BU zone took an awkward hop before surprising and eluding Acadia netminder Logan Flodell just 1:56 into the game. - Exactly two minutes later, redshirt junior Shane Switzer scored by converting a give-and-go with senior Ryan Cloonan in transition. - In the second, graduate student Max Willman at 1:35 before junior Patrick Curry cleaned up a rebound at the right post just under a minute later to push the lead to 4-0. - A nifty move in front of the crease by Wise midway though the middle stanza gave BU a 5-0 cushion entering the second intermission. - Just 41 seconds into the third, junior Patrick Harper's attempted pass went off an Acadia defender and in, making it 6-0. - Farabee's tally off a shorthanded rush capped BU's scoring before the Axemen spoiled the Terriers' shutout bid on a power-play marker with 3:14 left in regulation. - All three BU goaltenders played with junior Jake Oettinger stopping all 13 shots he faced over the first two periods. - Redshirt junior Max Prawdzik stopped nine of 10 shots before junior Nico Lynch made his first-ever appearance, earning one save in the final 3:14. - BU held a 34-24 shot advantage but came up empty on all three of its power-play chances. - Acadia went 1-for-6 with the man advantage. - Junior co-captain Dante Fabbro led all skaters with a plus-4 rating while Wise and Curry tied for the game high in shots with five. - BU will open the 2018-19 season next weekend with a two-game series on Oct. 12-13 at No. 10 Minnesota State. - Both game times in Mankato are set for 7 p.m. CT.